January 2012: The sky is darkened with the lame ducks of Britain’s Falklands policy coming home to roost. The UK is now re-violating the Treaty of Tlatelolco, which it did thirty years ago by bringing ships such as HMS Sheffield, armed with nuclear depth-charges, into the conflict. South America is a nuclear-weapons free zone. Britain has announced in January 2012 that it was sending a nuclear-armed destroyer, HMS Dauntless, to the South Atlantic region. Fox News reported that the Obama Administration was backing Argentina over the U.K. in the Falklands dispute. The Organization of American States earlier this week adopted a declaration calling for negotiations between the UK and Argentina over the “sovereignty” of the Falkland Islands. While the U.S. delegation did not speak in support of the measure, it ultimately joined a consensus adopting it. In response the South American trading bloc, Mercosur, is closing its ports to all ships flying the Falklands flag. Britian’s Foreign Office has closed half a dozen embassies in Latin America in recent years, to minimise the danger of receiving subversive opinions from foreign capitals. If oil is found in commercial quantities it will be difficult for any company to exploit it without the assistance and co-operation of the Argentinian mainland. Former head of the British army General Sir Michael Jackson said that it would be impossible for the British military to confront Argentina in case a military confrontation takes place over the sovereignty of the Malvinas islands. “What if an Argentinean force was able to secure the Mount Pleasant airfield? Then our ability to recover the islands now would be just about impossible,” said Jackson in an interview with the Sunday Telegraph. Likewise the head of the Naval task force in the Falklands War has warned that defence cuts mean Britain can now do “precisely nothing” to prevent Argentina retaking the islands. the Royal Navy no longer has aircraft carriers, has lost its force of Harrier jump jets and seen its warship fleet cut in half over the last decade. General Sir Peter Whiteley, a former commandant general of the Royal Marines, said: ‘If the Argentines decided to invade again we could never consider trying to take them (the Falklands) back because of our lack of naval resources.’ And Surgeon Rear Admiral Ralph Curr, the Royal Navy’s former medical director-general, added: ‘There’s no way we could defend the Falklands or re-engage the Argentines if it all happened again.’ In the Telegraph’s view, Britain can do ‘nothing’ to prevent Argentina retaking Falkland Islands. The Argentine senate has unanimously voted for a measure asserting the South American country’s “legitimate sovereignty” over the disputed Malvinas Islands. The draft document, known as the “Ushuaia Declaration,” was adopted ahead of the 30th anniversary of the war between Argentina and Britain over the islands, also known as the Falklands.The declaration also rejected “the persistent colonialist and militarist attitude of the United Kingdom” and warned against the “militarization” of the Malvinas. Britain has deployed its most sophisticated warship, HMS Dauntless, and a nuclear submarine to the South Atlantic to prevent Argentina’s possible counter-move. Tensions have been mounting in recent months over the South Atlantic islands, with the UN calling on Britain to discuss decolonization, but the UK has so far refused to do so. Thank you for your kind words of support for the actions of our Military Junta. Britain was very nasty making us lose the war for the Malvinas and deprived us of many opportunities, such as rallying home support for our corrupt and violent dictatorship, and even simpler things like rounding up the residents, drugging them, and throwing them out of aeroplanes, just like we enjoyed doing to our own people. This site is about the reasons for the sinking of the Belgrano. If you think it was OK because it resulted in an unpleasant miltary junta falling, well many people would agree with you. Nothing on this site expresses ‘support’ for that military junta, we are merely concerned to ascertain what they were trying to do over that period. In about 1976 there was a 100% recall of Plessey torpedos from RN. in 1989 a contracting electrician condemned the electrical installation of the top secret Plessey torpedo and sonar factory in Newport Gwent. He followed this up a couple of years later with a crime complaint to Gwent Police alleging fraud by the falsification of RN test data by Plessey since the mid 1970s. James Arbuthnot MP who may have been DTI at the time or defence Procurement intervened and the Gwent special Branch file was transferred to MOD Police where it appears to have arrived for nil action on the desk of a Mr Hartley Head of MOD Plod MOD procurement liaison. Gwent Special Branch had been investigating the factory for some long time suspecting the cause of RN weapon and sonar unreliability to be saboteurs. An imaginative line of inquiry but the contract electrician found more prosaically that the problem was technical coupled with management orchestration of falsification of RN Quality control tests and records. I think you would find that RN Intelligence had backstop quality control analysts. trained for such work was Commander Robert Green. I think Maggie Thatcher was briefed on such matters and that John Nott and her were not going to raise a task force. Perhaps an admiral persuaded them the war could be won by prosecuting it unlawfully so as to attack with the obsolete 1923 torps outside an EZ. IE That Maggie went to war legally but intending to prosecute it illegally. To gain the advantage Pearl Harbour style. Maybe that is why Nott stormed out of the Robin Day interview ? Accused of ignoring an admirals’ advice perhaps he knew too well that it was listening to an admiral that had committed UK to war. I welcome Argentinas plans to colonise the Islas Malvinas. They should set up concentration camps to sort out the “falkland” pirates! Then they should invade Chile to make them pay for supporting the uk, all those years ago..
Uruguay is a pitiful place that could also do with sorting out, then tomorrow the world!! Praise to our brave Argentinian comrades!! Sorry, but “nuclear depth charges”? You don’t help your case at all by sorting garbage like that. The UK had a full justification to take any military action it deemed necessary. Any military asset was a fair target as its continued existence could lead to it being used again in the future and Argentina had clearly demonstrated a wish to invade and harm the Falkland’s citizens. The UK would have been justified in attacking Argentina itself in order to demilitarise it and force an unconditional surrender. The same way it was okay to invade Nazi Germany and Japan during World War 2. Once Argentina revealed its intent to use those military assets in order to harm British citizens, the General Belgrano became fair game. You cannot break international law and illegally invade another country and then expect the other country to play by the rules. The UN has totally missed the crucial point, what is there to discuss? The Falklands are a self governing UK overseas territory, self governing means they are able to determine for themselves what happens and control their own affairs. To this end they held a referendum on the matter of whether they should retain links with the UK, and 99.8% voted in favour of staying a UK overseas territory. So where in that is there absolutely any room tp negotiate anything? The Falklanders have made their choice, and have spoken as one. So where does the UN or Agentina get off trying to impose anything upon the Falklanders, which they do not want? 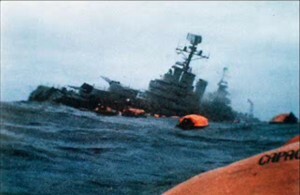 Sinking of the ARA general Belgrano 33 Years On…. The British were there since 1841. Argentina didn’t even have a stable government until 1861, after it’s civil war ended. How does Argentina have any lawful claim over the Falkland Islands, when Argentina didn’t even exist as a nation until 20 years AFTER the British had already settled there? Proximity does not equal ownership otherwise the US could lay claim to Bermuda and most of the Caribbean islands by way of proximity. Argentina chose the logic of war to resolve the issue of sovereignty over the islands. Argentina forfeited most of their right to gripe about what came next. (They would’ve gotten a big chunk of it back if Her Majesty’s Government had decided to carry out a Polaris live fire exercise with Puerto Belgrano as the impact area, but they didn’t.) The Belgrano was not any sort of vessel protected from enemy attack under international law; the Argentine government had committed an act of war against the United Kingdom; and Her Majesty’s Government was well within its rights as a belligerent to sink any man-of-war flying the Argentine flag, anywhere in the world. BTW, what’ is you folks’ take on Commander Alfredo Astiz’s actual, no-kidding war crimes committed on South Georgia? The argies invaded the falklands they did not go the diplomatic route . Sorry but are you asserting that such things as NDB’s didn’t exist? the existence of Nuclear Depth Bombs is not garbage. They don’t as far as a I know, have them now but they certainly did when I served in the eighties. What country, what nation, what people live on territory that was unoccupied when their ancestors ssttled? Lapps? Eskimos?